Star Trek V: The Final Frontier darn near killed the franchise. Actually, I originally thought it did kill the franchise, at least as far as the original series went: the film was such a critical and financial failure that it seemed to spell the end of the road for the original cast. By the time Frontier was released in 1989, Star Trek: The Next Generation was doing quite well and its cast seemed poised to make the leap to the big screen. Country offered something that most of the other films and much of the series lacked: a terrific sense of excitement. Oh, Star Trek always included its share of action, but they seemed to find a way to make these elements something less than scintillating. They moved the plot along and made the film more interesting, but they never seemed to accelerate your pulse the way the best scenes of films like Star Wars or Die Hard did. There was something kind of drowsy about the action in some of these productions. Some parts of Country seem a little silly. I mean, did we really need to see Kirk beat a baddie by kicking him in his privates? In addition, a few of the flick’s primitive digital effects haven’t aged well; I never realized how fake the zero gravity Klingon blood looked. I used to find Country to be at least on a par with 1982’s Star Trek II: The Wrath of Khan, but in retrospect, the older film remains clearly superior; it lacks Country’s hokier elements. Note that this DVD of Star Trek VI presents a cut of the film that differs from both the 1991 theatrical and 1992 home video renditions. 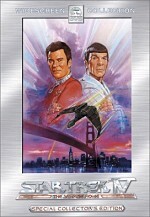 The 1992 home video version – also found on the 1999 DVD – adds a few minutes that deal with Starfleet’s proposed rescue of Kirk and McCoy as well as the plot to stop the peace process. The new DVD includes a 2003 recut of the film. It still includes the moments found in the prior home video renditions as well as a couple of minor alternate and additional shots. The material added to the 2003 version creates very small changes; most fans probably won’t even recognize them. The footage placed in the flick back in 1992 seems more obvious, especially since it involves a character not found in the theatrical cut via Colonel West (Rene Auberjonois). A lot of fans never liked those moments, and I must agree with them; I think the film works better without West and the conspiracy complications. However, they don’t make a huge difference, and it seems likely that we’re stuck with them; obviously director Nicholas Meyer prefers the film with those moments included. 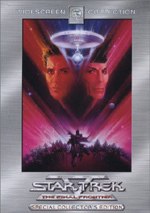 Star Trek VI: The Undiscovered Country appears in an aspect ratio of approximately 2.0:1 on this single-sided, double-layered DVD; the widescreen image has been enhanced for 16X9 televisions. Note that the disc presents an aspect ratio different than that of the flick’s theatrical exhibition. Country ran on the big screen at 2.35:1, but it has always been opened up moderately for home video; the 1992 laserdisc and widescreen VHS along with the 1999 DVD all used the same ratio found here. Others will argue whether or not this is a good or a bad thing, but at this point, it seems moot. Clearly director Nicholas Meyer prefers the less wide ratio, and it appears extremely unlikely that we’ll ever find a release of Country with different dimensions. In any case, the new transfer of Country improved a little upon the old non-anamorphic one. Sharpness mostly looked positive. At times, wider shots came across as a little iffy and ill defined, but those instances didn’t cause significant concerns. Instead, the majority of the flick appeared tight and detailed. No issues with jagged edges or shimmering occurred, and I noticed only a smidgen of light edge enhancement. On the other hand, colors seemed strong. The film presented a nice array of hues and made them look bright and vibrant. From the deep reds of the uniforms to the purple Klingon blood to the green lighting of the Klingon bridge, all the tones were detailed and concise. Blacks also seemed dense and tight, while low-light shots appeared detailed and well depicted. While most of Country looked quite good, all that grain made it look messier than I’d expect, so I felt it deserved a good but unexceptional “B” for picture. Though a little stronger than the old non-anamorphic transfer, this new one didn’t blow it out of the park. Both really looked quite similar. The new image was a little tighter due to the anamorphic enhancement, but otherwise, I saw very little to distinguish the pair. Of course, viewers with widescreen TVs will discern bigger differences, but on a 4X3 set – even one with the “anamorphic squeeze”, like my WEGA – I didn’t witness a big change between the pair. The anamorphic version looked better, but not to a huge degree. Fans of the prior five Star Trek 2-DVD special editions will know what to expect from this set. On the first disc, we open with an audio commentary from co-writer/director Nicholas Meyer and co-writer Denny Martin Flinn, both of whom sit together for their running, screen-specific track. They cover subjects such as the historical subtext of Country - particularly how it connects to the early Nineties Soviet Union – as well as variations from the original script and the writing process, approaching Trek as outsiders, and dealing with the series’ mythology. The conversation occasionally becomes enlightening, but it drags too frequently and suffers from too much dead air. The pair provide a moderately useful chat but not a terribly strong one. In addition to this piece, the DVD provides a text commentary written by Michael and Denise Okuda, the authors of the Star Trek Encyclopedia. If you’ve checked out Okuda’s text tracks for the first five Trek special editions, you’ll know what to expect here. The pair provide a wealth of interesting notes. They detail lots of connections between Country and other Trek efforts as well as locations, sets, and production design. We find out about many of the guest supporting actors and learn of trivia bits, inconsistencies and goofs. The commentary mentions variations among the 1991, 1992 and 2003 cuts of the flick. As with most of the prior text commentaries, it’s a good exploration of the different topics. After this we head to DVD Two and its supplements. These start with a documentary called The Perils of Peacemaking. In this 26-minute and 31-second piece, we get movie clips, various production and historical photos, and interviews. We hear from Meyer, actor/executive producer Leonard Nimoy, Georgetown University professor Dr. Angela Stent, and Ambassador Dennis Ross of the Washington Institute for Near East Policy. They discuss the historical context of the film, particularly as it connects to the Soviet Union of the era in which they flick was made. They also discuss diplomatic endeavors in general, as they apply to modern times, and get into how all these thoughts affected the story and characters. Ross’s insight seems especially valuable, but all the participants go over the material well in this unusually intelligent and insightful discussion. Although Stories from Star Trek VI breaks down into six smaller programs, we can view it straight through via the “Play All” option, so I decided to examine it as one long documentary. Taken that way, they run a total of 57 minutes and 18 seconds. 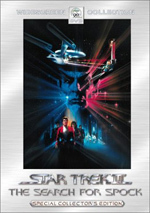 These incorporate movie snippets, archival materials, and comments from Meyer, Nimoy, Flinn, co-producer Ralph Winter, Star Trek V screenwriter David Loughery, co-producer/second unit director Steven-Charles Jaffe, cinematographer Hiro Narita, editor Ronald Roose, production designer Herman Zimmerman, scenic art supervisor Mike Okuda, Paramount project coordinator Penny Juday, composer Cliff Eidelman, and actors William Shatner, Christopher Plummer, and Todd Bryant. Within “The The Star Trek Universe”, a mix of featurettes appear. Conversations with Nicholas Meyer runs nine minutes, 31 seconds, and presents his thoughts on subjects such as films in general, working with actors, and his place in the Trek world. It’s a reasonably good piece, though some of the notes from the commentary reappear here. For the final component of “Universe”, we find Together Again. In the four-minute and 55-second program, we learn through interviews with them that actors Plummer and Shatner knew each other in their early days. We hear about their interactions back then in this short but cute featurette. Two pieces appear in the “Farewell” domain. DeForest Kelley: A Tribute goes for 13 minutes and 18 seconds as we see clips of the actor’s work and hear others discuss him. We find reminiscences from Plummer, Nimoy, Meyer, Winter, Campbell, Juday, Okuda, Loughery, Zimmerman, Shatner, producer Harve Bennett, and producer AC Lyles. They give us a minor career overview and some personal thoughts on Kelley. It’s a sweet and touching send-off to the actor. Lastly, we head to the “Archives”. Though I expected the Production Gallery to present stills, instead it mostly shows behind the scenes footage from the set. The three-minute and 20-second compilation seems moderately interesting but no better than that. Storyboards presents art for four scenes: “Praxis” (18 stills), “Assassins” (37), “Rura Penthe” (37), and the ”omitted” sequence “Leaving Spacedock” (28). These accumulate a decent little collection of art. Footnote: as always with Paramount releases, most of the video extras include subtitles. Other than the trailers, we find English and French text for all the materials. This continues to be a helpful feature. Arguably the best Star Trek flick, Star Trek VI: The Undiscovered Country has lost a little luster over the last 12 or so years. Nonetheless, most of it works nicely, and it remains probably the most exciting and fun of the series’ movies. This new DVD presents fairly solid picture quality plus very strong sound as well as a long list of good extras. With a list price of less than $20, this one’s a no-brainer for Trek fans. Even those who own the prior disc will want to upgrade to the new one, and those who possess no version of Country definitely should grab the Special Collector’s Edition. It’s a fine movie and a terrific DVD.